The only fool-proof method of determining your shoe size is to try on the shoes you plan to purchase. There are standard measurements that result in a shoe's size designation but those measurements can't tell the full story nor completely describe the unique form of each foot. The confusion regarding shoe sizing is compounded by the use of various scales of measurement used around the world. In the U.S.A. we have one system (divided further by gender). The U.K. uses another, and the rest of Europe has yet another system. There even more scales used in parts of Asia but, generally speaking, shoes typically use one of the three main scales (U.S., U.K, European). How do they determine shoe sizes? U.S. sizes do not directly correlate with European sizes. On the U.S. scale, each full-size increase is 1/3 inch longer. Each full-size increase on the European scale adds 2/3CM (roughly 1/4 inch). 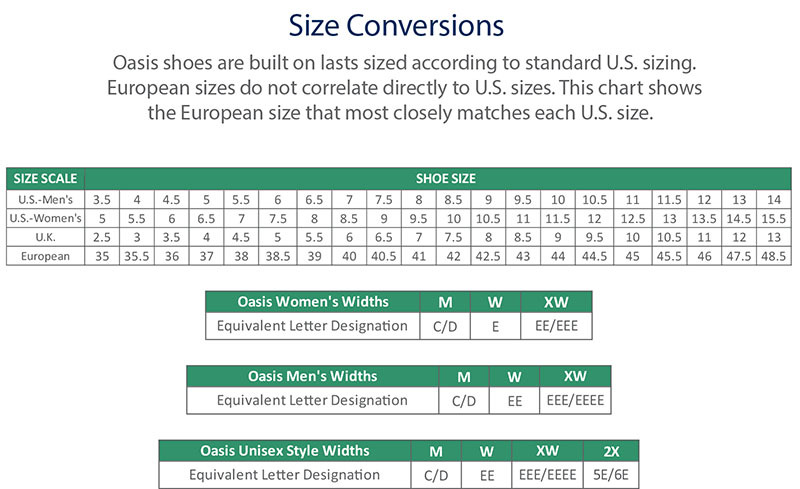 If you are looking for European-sized shoes from Oasis, use the conversion chart below to find the best match. You can also download the chart HERE.